Psst... Wondering how I ended up in Israel, and why I stay? Here's your chance to find out :). That is a lovely still photo. It would make someone's kitchen very special. Classy photo! 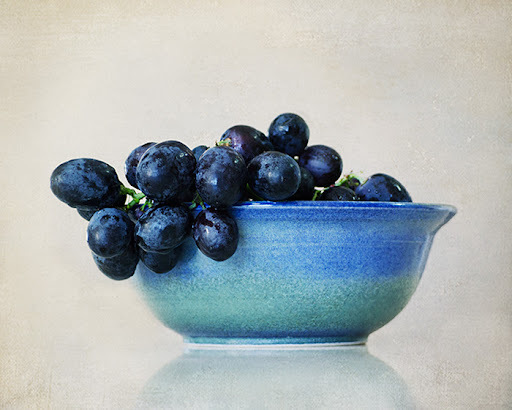 I love the blue bowl and grapes against the creamy background and the barely visible reflection of the bowl. Last post before bedtime and you made me hungry :) beautiful composition not to mention tempting! love the photo! like a lovely painting..
hope the son has a great time at camp. Very painterly and blue! Lovely. I remember examining the camp website for photos. My sleepaway son is home this summer, but next summer he is thinking of going to Israel. Ah, me oh my. It would be great for him. Gorgeous shot, it's a beautiful print. Glad your son is having a great time. Safe travels to you! Beautiful...not just the actual picture itself, but the items. Love the bowl and the fruit looks so yummy. Love the colors in the photo! Looks like a poster shot! Very nice composition! A Lovely shot! I love the blues. Glad to hear your good news! May he, you, & all your family continue to be safe, healthy, & happy. Stunning detail. I need to get over to etsy and check out your work! ha! great burglar warning.. glad to hear your son is having fun. Enjoy your trip. beautiful blues - love the way the grapes hang over the bowl and look so tempting to eat! have a great trip! Love the still life! Simple, elegant, beautiful!! Enjoy your time in the US! Lovely looking grapes! Hope your summer is working out well.